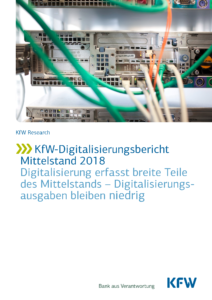 According to the 2018 digitization report of the German development bank KfW, the digitization of smaller and medium-sized companies in Germany is progressing gradually. Between 2015 and 2017, 30 % of the 3.76 million medium-sized companies have completed digitization projects successfully. In comparison to the years 2014 to 2016, the percentage has risen by four points. Encouragingly, the study also notes an increase of the digitization rate throughout companies of all sizes and almost all fields of the German economy. Digitization investments remained at a comparably low level: medium-sized companies spent short of EUR 15 bil. on digitization projects in 2017 – EUR 1 bil. more than during the preceding year. The most important topic for companies is the digitization of customer relations and supplier management at 56 %. Additionally, the “digitizers” are concentrating on the modernization of IT structures (53 %). The expansion of specific know-how (38 %) and the re-organization of workflows (25 %) are also relevant issues. The authors of the study are regarding one third of the smaller and medium-sized companies as “notorious stragglers” that were rarely using even basic digital applications. Simultaneously, only short of one fifth of the medium-sized companies may be considered digitization pioneers. ConMoto projects are introducing innovative paths to digitization as a lever for productivity gains in both medium- and larger-sized companies. Maintenance 4.0 improves the results of maintenance and asset management. Additionally, our lean transformation projects in production and logistics are utilizing economically sustainable new technologies. Contact us now – there is no more time to lose for your company!